Heat gas or charcoal grill. In shallow dish, mix oil, lime juice, chili powder and salt. Add chicken breasts, turning to coat. Place chicken on grill. Cover grill; cook over medium heat about 12 minutes, turning once, or until juice of chicken is clear when center of thickest part is cut (170°F). Remove from heat; slice crosswise into strips. Meanwhile, in 2-quart saucepan, heat beans, salsa and cilantro over medium heat, stirring occasionally, until thoroughly heated. 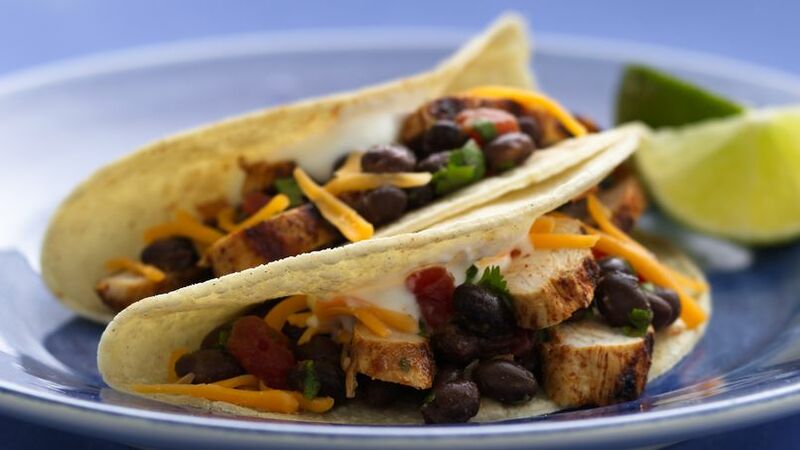 Divide chicken evenly onto half of each tortilla; top with beans, cheese and sour cream. Fold tortilla in half over filling. In step 2, cover grill; cook over medium-low heat. Feel free to take some liberties with this recipe. Use a grill pan to cook the chicken instead of a grill, and add other healthy toppings, such as lettuce and chopped tomatoes. To broil chicken, set oven control to broil. Spray broiler pan rack with cooking spray. Place chicken on rack in broiler pan. Broil with tops 4- to 6-inches from heat, about 12 minutes, turning once, until juice of chicken is clear when center of thickest part is cut (170°F). Cradle great Tex-Mex flavor when you hold one of these gluten-free tacos in your hand. Ole!